Frank Marshall’s trading post and ferry across the Blue River, established in 1852, were the start of the town of Marysville. In 1854 Marshall opened a post office and named it for his wife. This is the oldest civilian post office in continual operation in the state. Today Marysville is on two federal highways and one of the busiest railroad lines in the country. A $50 million railroad relocation and overpass project, completed in 2006, moved the tracks outside of town and provided two new bridges. The “short block”. In the 1850’s the two towns of Marysville and Palmetto were laid out side by side, resulting in just half a block between Broadway and Center (Highway 36). Marysville was south of Center Street and Palmetto was north. Sometimes visitors are told that one town was pro-slavery and the other against. Actually both towns were founded by pro-slavery settlers, but the Palmetto men soon lost interest in their town and Palmetto merged with Marysville. When the Civil War started most Marysville residents supported the Union. The “short block” is easy to see outside the tourist information office at 10th and Center Streets (Highways 77 and 36). Visitors can also pick up a brochure and map there for a walking tour of downtown Marysville. The statue was sculpted by Richard Berger in 1984 and is now at the center of a park where the railroad tracks used to be. 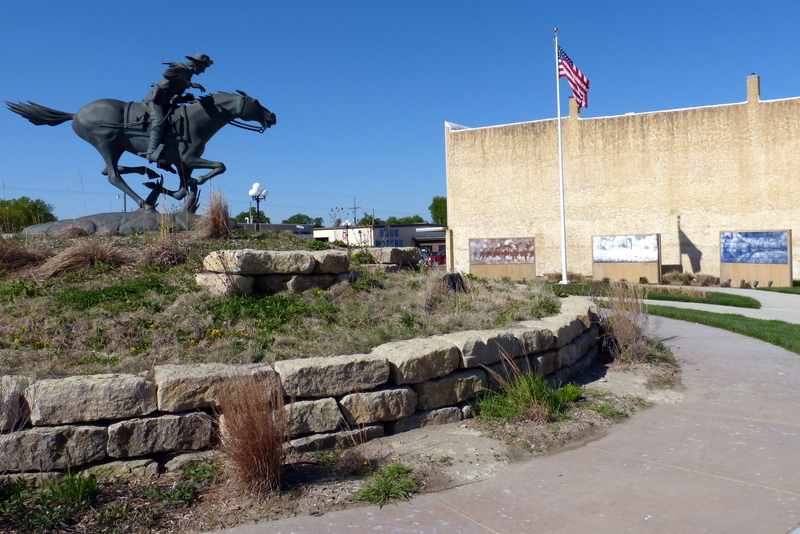 Three murals in the park depict a galloping Pony Express rider; an old steam engine morphing into a modern diesel locomotive; and photos of importance to Marysvilles’ heritage. Artist Rufus Seder, who created the murals, calls them “movies for the wall.” As the viewer walks along them, the image appears to move. 7th Street between Broadway and Hwy 36. Pony Express Home Station No. 1. National Register of Historic Places. This 1859 stone barn was used to stable the ponies during the 18 months of the Pony Express, 1860-61. Marysville was the first ‘home station’ west of St. Joseph (a station where riders as well as horses changed). Museum open April-October Mon.-Sat. 10-5, Sun. 12-4. 106 S. 8th Street, 785-562-3825. Pusch House, elegant residence built by cigar maker Charles Pusch in 1904. National Register of Historic Places. Private property; drive-by only. 10th and Elm Streets. The cigar factory at 10th and Broadway is now the home of the Marysville Mutual Insurance Co.
Charles Koester House (1876). National Register of Historic Places. Now a museum with many original furnishings and in the garden a collection of unusual white bronze statuary. Laura Ingalls Wilder and her family passed this house on the way to Missouri in 1894 and she described the lion and dog gates in her journal. Open in summer Mon.-Sat., 10-4:30, Sun. 1-4. 919 Broadway, 785-562-2417. Koester Block, bounded by Broadway, Elm, 9th and 10th Streets. National Register of Historic Places. The house at 10th and Elm was built in 1906 for Charles Koester’s son and is now a restaurant, Las Cabanas. The building where Reflections is now located (corner 9th and Broadway) was one of the earliest Montgomery Ward retail stores in the nation. 9th Street steps. A WPA project in the 1930s. East side of 9th Street at Carolina. Historic Courthouse (1891). 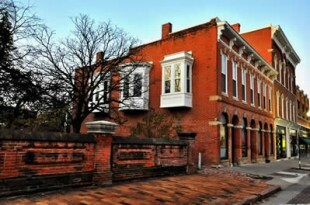 Elegant building constructed after a previous courthouse on the same site burned. National Register of Historic Places. The local historical society has a county history museum and genealogical research library here. 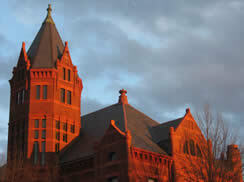 Open year-round Mon.-Fri. 1-4 p.m.; also Sat.-Sun. 1-4 p.m. in summer. 1207 Broadway, 785-562-5012, mchs@bluevalley.net. City Park and environs. West side of South 10th Street. Bommer School. Moved to Marysville from a rural site. Originally painted white. Open in summer. Steam engine. Engines like this brought trains into Marysville until the 1950’s. Playground. Built by local volunteers in 2001. Contains play-sized versions of three historic Marysville buildings. High school stadium, across 10th Street. Built in 1936 as a WPA project, still in use. Historic Trails Park, with a full-sized replica of a rope ferry like the one Frank Marshall used in the 1850’s to carry emigrants, soldiers and stagecoach travelers across the Blue River. Eight trails crossed the river here: the Oregon, Pike’s Peak and Mormon Trails, the St. Joe Road, the stagecoach, military and Pony Express routes, and the trail followed by Otoe Indians being sent to a reservation in Oklahoma. Take U.S. 77 south out of Marysville. Turn left immediately after the south overpass onto the levee road and go 1.4 miles. Turn left into park before the west overpass. 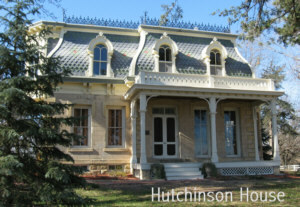 Hutchinson House (1872). National Register of Historic Places. French Second Empire house built by mill owner Perry Hutchinson, whose mill was just across the highway. In the 1920’s the house was used by the Marysville Country Club, which replaced the front porch with a veranda for open-air dancing. 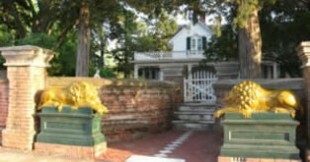 In 2006 the current owners rebuilt the porch to match the original. Private property. Drive-by only. West out of Marysville on Hwy 36, north on Hwy 77 ½ mile. 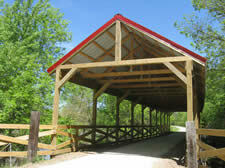 Blue River Rail Trail, hiking-biking trail north of Marysville. 13-mile trail with crushed-limestone surface. Open daily sunrise to sunset to bicyclers, runners, walkers and those with electric wheelchairs. Dogs must be leashed. The trail extends from Marysville along the former rail bed to the Nebraska state line. South end access: go north on 8th Street to Jayhawk Road, then left about 1/8 mile. See Google map at top of this page. Marysville Cemetery. The main gate and chapel are WPA projects from the 1930s, using local limestone. The chapel was dedicated in 1942 and intended for funeral services, but has never been used. Union soldier statue in center of cemetery was the first such monument in Kansas (1885). 16th Street between Debbie Lane and Park Street.